This, is going to be a mess. Bare with me though, and there will be some inspiration, some insight and some logic even in the eventual journey from this set of contra dictionary inspirational material to my personal regiment and contribution to the invitational. I think a full sub army within my Task Force Thorne. Like any team of people, Iron Sleet has its own dynamics, flows of energy, leadership, triumphs and struggles. I’ve often ended up carrying the tempo to keep things moving, so the prospect of this invitational (thank you Upplander, it was time!) and Toni jumping in to drive it, leaving me just to enjoy participating is an exciting and welcome brake. And I intend to enjoy the ride. Just create. Here is what I have decided. I will build a PDF regiment distinct to Thorn Moons, a hybrid of guard and skitari, typical to the most fortified and industrial of the Green Mechanicvm ruled moons, less changed by the Oldone architects than the borealis region of the Thorn Moon systems. This is a study of the kind of equipment necessary to survive the moons, and its hostile bio system and compromised atmospheres. 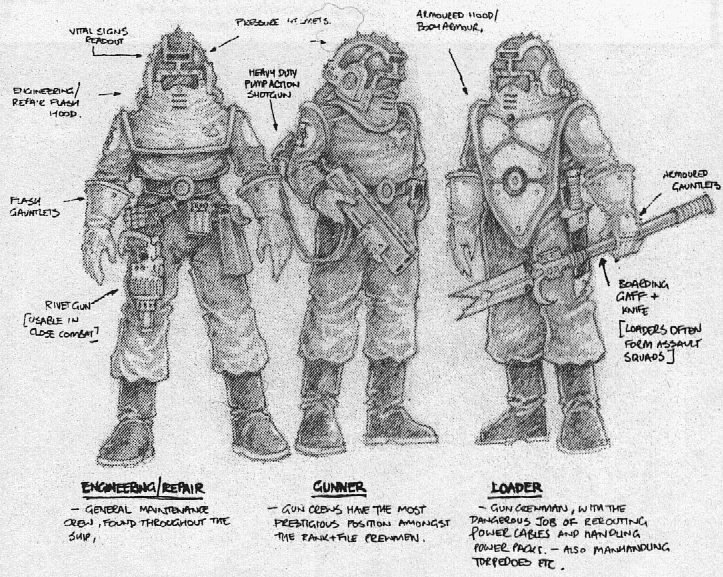 I want to give the unit an old school feel and a few custom built weapons, human scale bolters and other kit that speaks to the resourcefulness of their lords, the Blessings of Mars and the many headed angel and protector of the moons. No bare heads – this is a huge challenge that I will undoubtedly regret when Kari drops his sublime flagellant faces – if I can convey humanity the way the invitational challenges everyone to do, without the canvas of human face, I’ve done something special. Maybe. The fifth model will be a surprise that cleverly ties the above together in a heart of vulnerability. This in mind I’ve put together some inspirational material. A set of moody characters that convey humanity – Homo Mechanicum, Homo Borealis and whispers of my Regiment. When it comes to Imperial Guard – or any human military regiment – I also find historical references really helpful. I love the classic Osprey illustrations and have collected a sampling of esoteric units to draw inspiration from. I use these images to imagine my own regiment illustrated really fitting this format. Hopefully the first five are just a beginning of several different units fighting together with the Borealis Twists and the Ghost Legion. And when I get to the human agents of the 20th eventually, I’m going to loosen up and feature the few bare heads. Still with rebreathing equipment to survive without fungi and matter of the moons mutating them into more of it’s twisted children. I cant wait to see the actual figures. It may seem like a mess, but I think you nailed all the elements that make up what we seen now in the game and the design. Its all based loosely on themes we have seen in history, with some added Sci-Fi. Im currently working in some models to enter into the invitational! Great, not a mess at all. Can’t wait to see it all come to fruition. The first art piece with the Morion style helmet and chisel faced mask is fantastic. A tough one indeed, to sell humanity while covering its most defining feature, easy to fall into a trap of just skill masks and simulacrum too. Personal touches to each model, items and modifications that tell their story i think help personify the miniatures. I have no doubt you’ll smash this! Looking forward to seeing your work. Sounds very promising indeed. I really like the combined inspiration of those pictures. Good luck with this tricky task! It is good to hear some of your thoughts for creating some of the Thorn Moon’s more human defenders! It sounds like some of your ideas parallel things I have been thinking about for the last few months. Thus far there has been a lot of focus on some of the superhuman elements defending the Thorn Moons, such as the Elder Ones and the Green Machanicvm, but during the Great Crusade there would have been a large contingent of the Imperial Army accompanying the Adeptus Astartes. In the 10k years that followed, how were they affected? Without Astartes physiology or the blessing of the Machine God, how would humans cope with the hostile environments of the numerous Thorn Moons or aging in general? Likewise, has their heraldry changed and do they still follow the Imperial Truth, or has some different creed evolved? For creating models with some of these considerations in mind, I would like them to be distinct from the Green Mechanicvm and Elder Ones. Like you mentioned with those historical illustrations, I would like mine to be partially grounded in reality, contrasting with the larger-than-life Elder Ones. As you might expect, I will try to achieve part of this by converting more accurately scaled weapons for them. I am excited to see what you come up with, and am happy the Invitational will push me to put some of these ideas I have had in my head into model form! Great ideas, cant wait to see more of your excelent work.